will come to see every experience with money as a step toward awakening and a powerful lesson in understanding our relationship with others and with ourselves. Yet the book also reveals market-tested wealth-building skills including practical advice on budgeting and investing and the foundation of financial planning – the identification of goals and choices. While many of us assume that the issues of the spirit and of the marketplace are separate and incompatible, The Seven Stages of Money Maturity shows that it is only by exploring them together that we can attain true peace, freedom, and security in our money lives. Compared to other personal finance books that offer specific financial steps and planning strategies, this book focuses on the search for spiritual meaning in wealth. Kinder, a certified financial planner and former tax accountant, focuses on three composite figures, based on real people, to illustrate the seven psychological stages people go through in their relationship to money: Innocence (not knowing anything), Pain (discovering that we need to work to earn money), Knowledge (of such skills as saving and investing), Understanding (more sophisticated emotional wisdom about greed and inequality), Vigor (energy to reach financial goals), Vision (directing vigor outward, perhaps to a community) and Aloha (altruism without expectation of gain of any kind). Kinder provides useful questionnaires in which he urges readers to reflect on various questions: What are your three earliest memories of money? Why and how did money first enter your relationship with your mother, your father? While readers comfortable with spiritual self-exploration may enjoy Kinders approach, they will still have to turn to more traditional personal finance books for nitty-gritty money advice. Copyright 1999 Reed Business Information, Inc. –This text refers to an out of print or unavailable edition of this title. 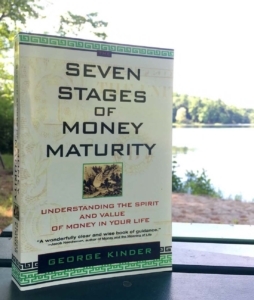 The Seven Stages of Money Maturity, by financial advisor and Buddhist teacher George Kinder, presents a totally original look at the ins and outs of individual economics. Drawing on timeless spiritual wisdom in addition to modern fiscal doctrine, Kinder deftly combines the philosophical and the practical to help readers broaden their understanding of the overall role that money plays in life from childhood onward–and, more importantly, put themselves on firmer footing with it today. Most financial advisors and books about money approach finance as if it were simply a skill to learn, the same sort of thing as hitting a fastball or speaking French like a diplomat. Money maturity does include skills, such as understanding investment options and using a budget effectively, but it goes much deeper, to the feelings, the heart, and, yes, the soul. By following three composite characters throughout the book and examining their experiences through the prisms of his own background and development, Kinder explains how to evolve naturally through these seven specific states (innocence, pain, knowledge, understanding, vigor, vision, and aloha) to achieve both financial and personal security. –Howard Rothman –This text refers to an out of print or unavailable edition of this title. This is a how-to book on money management, with a philosophical bent. The author, a CPA, provides readers with an awareness of the spiritual and psychological issues that surround money. With monetary expertise, practical experience, and a Buddhist orientation, Kinder offers a road map for understanding, deepening, and enriching the role that money plays in all areas of life and that leads to financial freedom. The book guides us through the seven stages of money maturity, beginning with innocence, or the absence of any concept of money. The next stages are pain, or realizing that some people have more and some have less money than others; adulthood, or the hard work of digging deep; knowledge, or learning financial techniques; understanding, or coming to terms with feelings about money; vigor, or developing the energy necessary to reach financial goals; and aloha, compassionate goodwill that allows use of the money without expecting a return. Kinder’s case studies and exercises help readers attain the necessary skills for developing integrity in their relationship to money. Mary Whaley –This text refers to an out of print or unavailable edition of this title.